"Yes, I'll take the third pipe bomb on the right, please." Interesting that they are advertising the airport like a mall for jet-setters. Obviously before airport terrorism. I don't know what they're saying either but it's still very cool. "Airports of Paris: the boutiques, the services, the restaurants, the hotels just like in Paris." 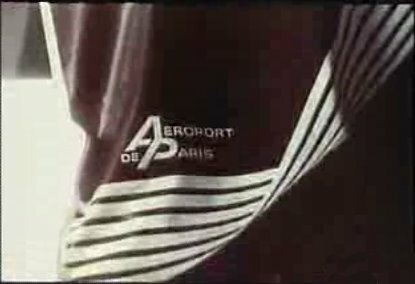 The emphasis on the airport shopping experience in ads was actually quite common in Europe well into the 1980s and 1990s. For example, Amsterdam's Schiphol airport used to emphasize the great shopping opportunities in their "Buy & Fly" ads, but then Schiphol does have a big mall accessible both to flight passengers and casual shoppers. Still my favourite airport. Paris (both Charles de Gaulle and Orly airports) on the other hand still seemed to be stuck very much in the 1970s the last time I was there (sometime in the 1990s) and the shop selection wasn't that great. Should be of note the song is the Bee Gees' "I Started A Joke". It would figure this was what it was all about. I only wish I could go back to those days when it all seemed so simple.